^ Crossland, David. 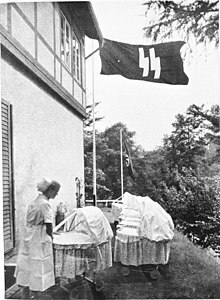 Nazi Program to Breed Master Race: Lebensborn Children Break Silence. Der Spiegel (Hamburg). 2006-11-07 [2011-08-15]. ^ Albanese, Patrizia. Mothers of the Nation: Women, Families and Nationalism in Twentieth-Century Europe. Toronto: University of Toronto Press. 2006: 37 [2011-08-15]. ISBN 978-0-8020-9015-7. ^ Office of United States Chief of Counsel For Prosecution of Axis Criminality. Barrett, Roger W.; Jackson, William E., 编. Nazi Conspiracy and Aggression [Founding of the organization "Lebensborn e.V. ", 13 September 1936] (PDF) 5. Washington, DC: United States Government Printing Office: 465–6. 1946 [2011-08-16].